Aadil’s experience of holistic healing was originally prenatal, as his mother could not conceive for 7 years and, only after practicing yoga with B.K.S. Iyengar did she conceive Aadil, her first child. She practiced yoga throughout her pregnancy. Aadil began observing Iyengar’s classes at the age of three, commenced formal study at the age of seven, and was the youngest person to be awarded the Advanced Yoga Teacher’s Certificate at the age of twenty-two! 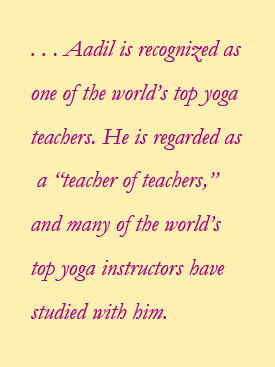 Today, over 30 years later, Aadil is recognized as one of the world’s leading yoga luminaries and innovators. He is respected as “teacher of teachers,” as many of the world’s leading yoga instructors have been guided by him. He has a unique teaching style, mixing melodious instructions with recitations of poetry, philosophical insights, and in-the-moment humor. Aadil and Savitri are the founders of Purna Yoga, a holistic synthesis of yogic traditions based on the work of Sri Aurobindo and The Mother. Aadil and Savitri also founded Alive & Shine Center in Bellevue, Washington, the home of Purna Yoga College, a 200-hour, 500-hour and Certificate-Level (2000 hour) teacher training program licensed by the State of Washington and Yoga Alliance Certified. Aadil teaches seminars, classes, teacher trainings, and workshops at the Alive and Shine Center and has taught throughout the United States, Canada, Europe, Mexico, India, and other parts of Asia. Aadil is the author of Fire of Love: for Students of Life, for Teachers of Yoga, a book that seeks to restore the rapidly fading essence of yoga. He has also co-authored three manuals with Savitri, which are used in his beginning, intermediate, and therapeutic teacher trainings. In addition, Aadil has written extensively for Yoga Journal, having been the Asana Columnist and author of the Teacher’s Column for the website, as well as the “Asana Expert” for both the magazine and the website. An encyclopedic knowledge of health informs Aadil’s teaching. Aadil was a certified Shiatsu and Swedish bodywork therapist and a Clinical Hypnotherapist. He has studied holistic healing and Ayurveda extensively. He uses these prior qualifications to enhance his teaching today and continues to be a student in the holistic healing arts. Starting with a bachelor’s degree in physics and math, Aadil eventually got a degree in law. He practiced law in Washington State until resigning to devote his energies to his life-purpose of exploring and teaching Purna Yoga. He has a passion for the arts, especially poetry, and has intensively studied elocution, operatic singing, Japanese flower arranging, painting, and drawing. Aadil and Savitri co-hosted the Alive and Shine Radio Show for over 3 years. Archives can be heard at www.AliveAndShineShow.com. Aadil has served as advisor/board member to many organizations including Prevention Magazine, Yoga Alliance, Yoga Journal, The Iyengar Yoga National Association of the United States, and The National Association Certification Committee. His educational lectures take him throughout the U.S., Europe, Asia, Canada, Mexico, and India. Aadil has been featured in newspaper and magazine articles locally, nationally, and internationally, and has been a guest speaker and presenter on television and radio programs and news shows. He enjoys speaking professionally and has been the keynote speaker at many national events including Yoga Journal Conferences, The Omega Institute, The Body, Mind, Spirit Symposiums and the Global Information Network. Aadil works diligently with people who desire a better quality of life through a humanistic approach to wealth and health through asana. Aadil is lives in Bellevue, with his wife Savitri and has a daughter named Zenia. Zenia manages the family businesses, as well as being a musician and actress.